VoIP call recording software for popular VoIP applications such as Skype, Google Talk, Windows Messenger, Yahoo Messenger, and the rest is something I get asked about all the time. I can't tell you how many times I get email requests for recommendations for the best VoiP call recording software as well as requests for call recording software and/or hardware to record strictly PSTN or traditional PBXs conversations. Even the VoIP Forums has a few threads involving requests for call recording, including this three-page thread titled "Call Recording Software" and this VoIP Forum posting, "SOHO VoIP call recording". It's tough when I get so many of these help requests (usually via email, sometimes via phone) since it is in my nature to want to help people out. However, I am getting paid by TMC to test VoIP products, write product reviews, and provide my own VoIP industry analysis - and not to be a personal consultant for everyone that asks me for assistance. Don't get me wrong though, I often DO respond to email queries for help. If the request is simple, I usually respond, but often times the answer is quite complex - it depends on the user's exact requirements, what type of network environment, etc. that would just take to long to solve their problem with a single email. So if I spend too much time of my workday playing "VoIP consultant" to strangers, my boss will not be happy with me. You don't want me to get fired, now do you? Nevertheless, since I have received so many queries about VoIP call recording, I thought I would provide some useful info - a "VoIP Recording FAQ/Primer" if you will. I should point out that there are several companies offering VoIP call recording both for the enterprise and for personal use. First, let's look at enterprise-class VoIP call recording solutions that are used to record conversations on IP-PBXs/VoIP hard phones and then we'll look at personal call recording solutions that work with Skype, Google Talk, etc. First, NICE Systems is one of the leaders in enterprise VoIP recording. In fact, NICE solidified their industry-leading position by purchasing Dictaphone's call recording business last year, which was one of NICE's competitors and was one of the leaders in call recording and quality management. NICE Systems VoIP recording technology is fully integrated within NICE's current product line, NiceLog and NiceUniverse, enabling any NICE user to add VoIP recording into their present environment. The solution provides intelligent recording of VoIP interactions for full-time recording, recording-on-demand and quality management. I know they are interoperable with Cisco Systems' Internet Protocol Contact Center (Cisco IPCC), but I'm sure NICE integrates with other VoIP solutions as well. Witness Systems is another well-known company offering very good call recording and QM (quality monitoring) solutions, including their flagship VoIP recording product called eQuality ContactStore for IP . They claim to be the first to support SIP call recording. Now let's look at some "personal use" VoIP recording solutions. If you are using a hard IP phone, such as a Cisco 7900 series IP phone, then you can use a cheap telephone recorder device, such as the Recorder Control - Model 43-228 ($26.99), which you can pick up at Radio Shack. It is designed to work with a standard tape recorder and features a "remote tape control" feature that automatically starts/stops the tape. Thus, it automatically records when receiver is lifted from the phone. 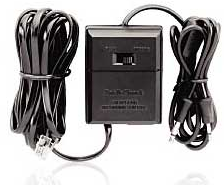 Of course, most people will want to record to their PC instead, so you can simply connect the microphone output to your PC's sound card and leave the tape control output plug unplugged. 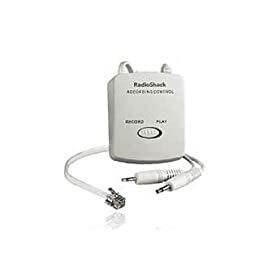 Even better, you can use this new model called the Smart Phone Recorder Control which is also made by Radio Shack which is available to for purchase on Amazon. It starts your recorder automatically when the phone receiver or handset is picked up. Nice feature to have! 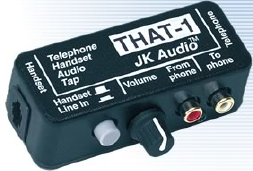 If you want to go really high-end (and expensive $125), the JK Audio THAT-1 is a high-end telephone recorder used by radio stations to record and play sound bytes. The grey pushbutton selects which audio will be sent into the telephone (OUT = talking on the handset, IN = sending audio in through the RCA jack). 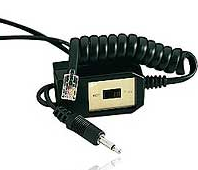 The output RCA jack contains a mix of the audio from both sides of the conversation, as well as the tones being pressed on the keypad. The volume control adjusts the volume of the signal going to your powered speaker or tape recorder. I use a THAT-1 connected to my phone's handset to record my phone conversations and it works great with excellent sound quality. But you will pay a premium for this unit. TelRex CallRex - is a software-based VoIP call recording solution that supports integration with 3Com NBX, Cisco Call Manager, Mitel ICP, Nortel BCM, Artisoft Televantage, Avaya IP Office, Siemens HighPath, NEC NEAX, Shortel Shorewave, and Zultsys MX250. ASC's VoIP Server Software eVOip captures VoIP packets and allows the user to store, reproduce, archive and play back the entire interaction. EVOip is a passive VoIP recording solution that monitors the RTP / RTCP packages on local area networks (LANs). They currently support tight integration with Cisco, Avaya, Siemens, innovaphone, Mitel, Nortel, and a few more, but they claim it operates with any IP vendor or signaling protocol. They even offer a free 1-license download for trial. An option to go "cheap" is to download the FREE open-source Ethereal packet sniffer program. Ethereal can decode VoIP packets, including the RTP stream and save it as an .au file (you can convert to .WAV if you need to, but most likely your PC will play .au files. You just leave the software running on your PC in the background and then setup a filter to only capture VoIP traffic. It won't work with Skype, but should support many other VoIP applications and IP-PBXs, especially those that support the SIP standard. Ethereal 0.99.0 has a functionality RTP Analysis that can be used to convert RTP packets to ".au" sound-file. There are a lot of programs that can convert from .au to .wav if you really need to use the .wav format but actually you should be able to play the .au file direct, I assume. Currently this only works for G.711 (PCMU and PCMA). Then you mark one of the RTP packets and use the "Tools/Statistics/RTP Analysis..." menu item to obtain some statistics about delay and jitter. If the codec is G.711 (PCMU/PCMA) you should be able to use the "Save voice data as..." button in the RTP Analysis window. Yet another option, WinEyeQ VoIP network capture utility They have a trial version that comes bundled with Win Pcap 3.0 (packet capture driver) and is designed specifically for VoIP. - Completely software-based test tool. vEmotion by VoiceEmotion.com is a personal use VoIP recording product that works with all of the major IM/VoIP software clients, including Skype, AIM/AIM Triton, Gtalk, Msn, Yahoo Messenger, QQ, ICQ, and Windows Live Messenger. It has some cool features, including the ability to set background music for VoIP conversations so you can share music with your friends. The nice thing about this software is that it's automatic. When you begin a VoIP call, recording automatically begins. When the call ends, the recording stops automatically and a new record is stored. • Send voice emotions (lively audio clips) to who are talking with you. Anything you have inconvenience in expressing it with your mouth or text, you can communicate it by voice emotions. • Record voice conversations into disk files, in single-track, dual-track or single-track double frequency mode. Data is encrypted, and passwords can be assigned to protect your call records against unauthorized access. Finally, here are some other call recording solutions. Some are for enterprise use and others for personal use. Cain and Abel is an interesting VoIP call recording application. Cain & Abel was designed as a "network administrator security tool" to pinpoint security holes. I put that it quotes, since it can also be used as a hacker's tool. Essentially, this "security" software product can record your SIP-based VoIP applications. Cain's sniffer can now extract audio conversations based on SIP/RTP protocols and save them into WAV files. The following codecs are supported: G711 uLaw, G711 aLaw, GSM, MS-GSM, ADPMC, DVI, LPC, L16, G729, Speex, iLBC. Gabcast is a unique hosted call recording application that actually lets you instantly create podcasts for your blog with integration with your blogging software. The neat thing about Gabcast is that it supports conference calling their service both via the PSTN and VoIP. Using your favorite SIP softphone you simply dial the SIP address: 422@sip.gabcast.com along with other particpants dialing in using PSTN or VoIP and it will record the conference call into mp3 format. Hotrecorder is another option, which I wrote about here. It works with PC-initiated calls through Skype, AOL Instant Messenger, Net2Phone, Yahoo! Messenger and probably others. The free version of the software is supported by advertisements that are targeted according to the consumer's location, gender or age or you can buy the software ad-free for $14.95. Oreka.org is an open source VoIP recorder developed by www.orecx.com. Orecx develops and sells add-ons, extensions and services to this open source core recorder that has been adopted by dozens of enterprise users so far including a 2500 seats deployment at http://www.jppol.dk/ in Denmark. Call Shadow Technology - They offer a low-cost yet feature-rich call recording solution (10 phones for $3,000) and support Cisco Call Manager. In fact, they have an XML phone service which allows replaying calls directly on the phone, and is integrated with CallManager's user directory (LDAP DCDirectory) for unified authentication. The aforementioned are just a sampling of the VoIP call recording solutions out there -- I could go on and on with a list of many other solutions, but hopefully this will give you a a headstart in finding the right VoIP call recording solution. Feel free to drop me a line with any good VoIP call recording solutions you use or if you need help with any VoIP solution. I'll do my best to try and help you out. Skype From Your Home Phone - FINALLY! VoIP call recording software for popular VoIP applications such as Skype, Google Talk, Windows Messenger, Yahoo Messenger, and the rest is something I get asked about all the time. I can't tell you how many times I get email requests for recommendations for the best VoiP call recording software as well as requests for call recording software and/or hardware to record strictly PSTN or traditional PBXs conversations. Even the VoIP Forums has a few threads involving requests for call recording, including this three-page thread titled \"Call Recording Software\" and this VoIP Forum posting, \"SOHO VoIP call recording\".\n\nIt's tough when I get so many of these help requests (usually via email, sometimes via phone) since it is in my nature to want to help people out. However, I am getting paid by TMC to test VoIP products, write product reviews, and provide my own VoIP industry analysis - and not to be a personal consultant for everyone that asks me for assistance. \n\nDon't get me wrong though, I often DO respond to email queries for help. If the request is simple, I usually respond, but often times the answer is quite complex - it depends on the user's exact requirements, what type of network environment, etc. that would just take to long to solve their problem with a single email. So if I spend too much time of my workday playing \"VoIP consultant\" to strangers, my boss will not be happy with me. You don't want me to get fired, now do you? \n\nNevertheless, since I have received so many queries about VoIP call recording, I thought I would provide some useful info - a \"VoIP Recording FAQ/Primer\" if you will.\n\nI should point out that there are several companies offering VoIP call recording both for the enterprise and for personal use. First, let's look at enterprise-class VoIP call recording solutions that are used to record conversations on IP-PBXs/VoIP hard phones and then we'll look at personal call recording solutions that work with Skype, Google Talk, etc. \n\nFirst, NICE Systems is one of the leaders in enterprise VoIP recording. In fact, NICE solidified their industry-leading position by purchasing Dictaphone's call recording business last year, which was one of NICE's competitors and was one of the leaders in call recording and quality management. NICE Systems VoIP recording technology is fully integrated within NICE's current product line, NiceLog and NiceUniverse, enabling any NICE user to add VoIP recording into their present environment. The solution provides intelligent recording of VoIP interactions for full-time recording, recording-on-demand and quality management. I know they are interoperable with Cisco Systems' Internet Protocol Contact Center (Cisco IPCC), but I'm sure NICE integrates with other VoIP solutions as well.\n\nWitness Systems is another well-known company offering very good call recording and QM (quality monitoring) solutions, including their flagship VoIP recording product called eQuality ContactStore for IP . They claim to be the first to support SIP call recording.\n\n Now let's look at some \"personal use\" VoIP recording solutions. If you are using a hard IP phone, such as a Cisco 7900 series IP phone, then you can use a cheap telephone recorder device, such as the Recorder Control - Model 43-228 (\$26.99), which you can pick up at Radio Shack. It is designed to work with a standard tape recorder and features a \"remote tape control\" feature that automatically starts/stops the tape. Thus, it automatically records when receiver is lifted from the phone. Of course, most people will want to record to their PC instead, so you can simply connect the microphone output to your PC's sound card and leave the tape control output plug unplugged.\n\n Another Radio Shack model is the Mini Recorder Model 43-1237 (\$17.99), which is a bit cheaper than the 43-228 model, but it doesn't have the automatic record feature when the telephone receiver is lifted from the phone. Still, since most users don't need the remote tape control, this device should suffice for most users. You can buy the 43-1237 online on Amazon for about \$15. However, the one 43-1237 model I did try had a lot of static/noise in the background. I'm not sure if I got a defective unit or if the mic plug was not the correct size. It's possible this model was designed specifically for tape recorders mic input and not a PC's sound card. They are similar, but not exactly the same. [Note: This model is discontinued]\n\n Even better, you can use this new model called the Smart Phone Recorder Control which is also made by Radio Shack which is available to for purchase on Amazon. It starts your recorder automatically when the phone receiver or handset is picked up. Nice feature to have! \n\n If you want to go really high-end (and expensive \$125), the JK Audio THAT-1 is a high-end telephone recorder used by radio stations to record and play sound bytes. The grey pushbutton selects which audio will be sent into the telephone (OUT = talking on the handset, IN = sending audio in through the RCA jack). The output RCA jack contains a mix of the audio from both sides of the conversation, as well as the tones being pressed on the keypad. The volume control adjusts the volume of the signal going to your powered speaker or tape recorder. I use a THAT-1 connected to my phone's handset to record my phone conversations and it works great with excellent sound quality. But you will pay a premium for this unit.\n\nTelRex CallRex - is a software-based VoIP call recording solution that supports integration with 3Com NBX, Cisco Call Manager, Mitel ICP, Nortel BCM, Artisoft Televantage, Avaya IP Office, Siemens HighPath, NEC NEAX, Shortel Shorewave, and Zultsys MX250.\n\nASC's VoIP Server Software eVOip captures VoIP packets and allows the user to store, reproduce, archive and play back the entire interaction. EVOip is a passive VoIP recording solution that monitors the RTP / RTCP packages on local area networks (LANs). They currently support tight integration with Cisco, Avaya, Siemens, innovaphone, Mitel, Nortel, and a few more, but they claim it operates with any IP vendor or signaling protocol. They even offer a free 1-license download for trial.\n\nAn option to go \"cheap\" is to download the FREE open-source Ethereal packet sniffer program. Ethereal can decode VoIP packets, including the RTP stream and save it as an .au file (you can convert to .WAV if you need to, but most likely your PC will play .au files. You just leave the software running on your PC in the background and then setup a filter to only capture VoIP traffic. It won't work with Skype, but should support many other VoIP applications and IP-PBXs, especially those that support the SIP standard.\n \nHere's some info from Ethereal's web site:\n____________________________________________________\nEthereal 0.99.0 has a functionality RTP Analysis that can be used to convert RTP packets to \".au\" sound-file. \nThere are a lot of programs that can convert from .au to .wav if you really need to use the .wav format but actually you should be able to play the .au file direct, I assume. Currently this only works for G.711 (PCMU and PCMA).\n\nIf the RTP packets are not shown as RTP you first have to select one of the packets and use the \"Tools/Decode As...\" menu item and select that the packets shall be decoded as RTP. http://www.ethereal.com/faq.html#q5.21\n\nThen you mark one of the RTP packets and use the \"Tools/Statistics/RTP Analysis...\" menu item to obtain some statistics about delay and jitter. If the codec is G.711 (PCMU/PCMA) you should be able to use the \"Save voice data as...\" button in the RTP Analysis window.\n\nYet another option, WinEyeQ VoIP network capture utility They have a trial version that comes bundled with Win Pcap 3.0 (packet capture driver) and is designed specifically for VoIP. \n\nJust to give you an idea of what types of features to look for in a VoIP call recording software solution, I'll include WinEyeQ's Voice and Video Call Monitor/Analyzer features:\n\n- Completely software-based test tool.\n- A true H.323 and SIP call monitor with complete call analysis and media monitoring \n- Detects new H.323 and SIP call attempts (both inbound and outbound) automatically \n- Maintains registration information to gatekeepers and registrars giving you a complete call profile \n- Detailed reporting of protocol violations and call anomalies as well as user-defined alerts and alarms \n- Detailed reporting for network usage, call summaries, call traces and media QOS measurements \n- Monitor entire network segments or specify IP addresses or ranges \n- Measure bandwidth usage of VoIP signaling, voice, video and other network traffic \n- Set watches for key call identifiers such as E.164 number, SIP ID or IP address \n- Specify protocol layers to monitor (IP, TCP, UDP, RAS, H.225, H.245, SIP, RTP, RTCP, etc.) \n- Detect and alert unwanted traffic on the network\n\n \n\nvEmotion by VoiceEmotion.com is a personal use VoIP recording product that works with all of the major IM/VoIP software clients, including Skype, AIM/AIM Triton, Gtalk, Msn, Yahoo Messenger, QQ, ICQ, and Windows Live Messenger. It has some cool features, including the ability to set background music for VoIP conversations so you can share music with your friends. The nice thing about this software is that it's automatic. When you begin a VoIP call, recording automatically begins. When the call ends, the recording stops automatically and a new record is stored.\n\nOther features include:\n• Send voice emotions (lively audio clips) to who are talking with you. Anything you have inconvenience in expressing it with your mouth or text, you can communicate it by voice emotions.\n• Record voice conversations into disk files, in single-track, dual-track or single-track double frequency mode. Data is encrypted, and passwords can be assigned to protect your call records against unauthorized access.\n\nFinally, here are some other call recording solutions. Some are for enterprise use and others for personal use.\n\nCain and Abel is an interesting VoIP call recording application. Cain & Abel was designed as a \"network administrator security tool\" to pinpoint security holes. I put that it quotes, since it can also be used as a hacker's tool.\n\nEssentially, this \"security\" software product can record your SIP-based VoIP applications. Cain's sniffer can now extract audio conversations based on SIP/RTP protocols and save them into WAV files. The following codecs are supported: G711 uLaw, G711 aLaw, GSM, MS-GSM, ADPMC, DVI, LPC, L16, G729, Speex, iLBC.\n\nGabcast is a unique hosted call recording application that actually lets you instantly create podcasts for your blog with integration with your blogging software. The neat thing about Gabcast is that it supports conference calling their service both via the PSTN and VoIP. Using your favorite SIP softphone you simply dial the SIP address: 422@sip.gabcast.com along with other particpants dialing in using PSTN or VoIP and it will record the conference call into mp3 format.\n\nHotrecorder is another option, which I wrote about here. It works with PC-initiated calls through Skype, AOL Instant Messenger, Net2Phone, Yahoo! Messenger and probably others. The free version of the software is supported by advertisements that are targeted according to the consumer's location, gender or age or you can buy the software ad-free for \$14.95.\n\nOreka.org is an open source VoIP recorder developed by www.orecx.com. Orecx develops and sells add-ons, extensions and services to this open source core recorder that has been adopted by dozens of enterprise users so far including a 2500 seats deployment at http://www.jppol.dk/ in Denmark.\n\nCall Shadow Technology - They offer a low-cost yet feature-rich call recording solution (10 phones for \$3,000) and support Cisco Call Manager. In fact, they have an XML phone service which allows replaying calls directly on the phone, and is integrated with CallManager's user directory (LDAP DCDirectory) for unified authentication.\n\nThe aforementioned are just a sampling of the VoIP call recording solutions out there -- I could go on and on with a list of many other solutions, but hopefully this will give you a a headstart in finding the right VoIP call recording solution. Feel free to drop me a line with any good VoIP call recording solutions you use or if you need help with any VoIP solution. I'll do my best to try and help you out.